Mujitsu and Tairaku's Shakuhachi BBQ / What makes one shakuhachi better than another? » What makes one shakuhachi better than another? What makes one shakuhachi better than another? Since I love to stir up trouble I have another question: In the realm of higher quality shakuhachi, what makes one shakuhachi " better " than another? Here is the back story. I recently purchased an unusual, and very nice Kono Gyokusui II flute. So far, of the flutes I have played ( this is only for 1.8 length ) it is the shakuhachi I like best. I may have the opportunity to try out one or more Inoe Shigemi flutes and possibly a Miru Kindo. I have read the statement 3 times now from 3 different shihan or above players that even the best Gyokusui will not be as good as a Shigemi or Kindo. I find that once I got to a certain level of flute, there are definitely some that I like better than others, so for me some are better than others. However, I could certainly understand where someone would like another flute more depending on personal taste, the music they like to play, etc. So my questions is, what are the objective criteria that allow for statements like, " no Gyokusui can be as good as a Shigemi " ? I assume that at this level, things like pitch are a given. I assume that a Shigemi would have better balance including balance between octaves? Are there differences on tone? Volume? Dynamics? What else? Re: What makes one shakuhachi better than another? Mark, we may be in the wrong section for a general discussion of this sort, but I would like to say that having played 25 different 1.8s in 1 1/2 years suggests an interesting phenomenon. Here in Japan, usual players might play only one instrument for many years from the beginning and possibly for their entire career as chosen by their teacher typically. Since I'm somewhat in the business of moving flutes around, it never ceases to amaze me how quickly people outside of Japan go through flutes or amass them. I would like to also suggest that there is a certain mystique surrounding some maker's product that the wonders of the internet served to fuel as a result of a few flints sparked by an even fewer number of fire starters. That's the way it works. Someone placed up here says so-and-so is good, then 25 people down there say the same so-and-so is good (because they heard it from that person up there ) and the mystique starts. It may all be based on an educated judgment originally, but it is definitely colored by individual bias as well. In short, if you have a shakuhachi that you love; that allows you to play the music you want to play; that seems to have the qualities in its making that will allow you to expand with time, why are you looking to go beyond that just because somebody said something else was better? After 1 1/2 years of playing, it's unlikely that the differences will be appreciable, though after 20 years they might be. There is much to develop in yourself first. I realize that you are ostensibly asking for general comments, but it also looks like you suspect that what you have might not be good enough. Comments like "no Gyokusui can be as good as a Shigemi" are spoken recklessly if they aren't preceded by " I think...". You're confusing me. Here you say "in the realm of higher quality shakuhachi"... If it's already been labeled as a "higher quality shakuhachi", you've already determined it to be better unless you include characteristics aside from playability. I'm fairly certain some of the delineation between "higher quality" and lesser quality is aesthetics as almost all of the high price tag instruments are astoundingly beautiful. What's your definition of quality? Qagh! My favorite!!!! ... How did you know? Anyway, regarding " higher quality shakuhachi " sorry for the lack of definition. For the purposes of this conversation, let's say bamboo shakuhachi that will generally retail in the realm of $2,500 or more. I will leave out of that " collector shakuhachi " those that are very old, historically significant, or have other qualities not related directly to playing that would tend to drive up the price. So, hope that helps. For the record, it is a bit of a loaded question ( gee who'd 'a thunk? ) and I generally agree with Jeff's comments above. "Good Kindo and Inoue flutes are better than any Gyokusui." Translation: "I have played a lot of flutes by those makers and this is my observation." But I was referring to jiari 1.8's. Your flute is jinashi so it's comparing apples and oranges I suppose. If you read "Zen and the Art of Motorcycle Maintenance", you will know that the definition of "quality" is a tricky thing, and drove at least one very brilliant philosopher barking mad in contemplating it. Basically, to me it means the ease with which an object allows me to do what I want to do with it. A cheap hammer is a better quality tool for driving a nail than the most expensive shakuhachi. This debate is no different than "Which film was the best of the last decade?". Everyone has a differing opinion. Better yet, it is like the debate about which is the best camera. Best for what? There is a school of photography in Japan called Lomography, after a cheap, plastic camera called the Lomo. The pix from this beast are blurry, distorted, hazy and can be altogether stunning despite all that, or in fact because of it. 2. That can take a lot of air, but doesn't necessarily _need_ a lot air in order to arrive at pitch. 3. That takes a reasonable amount of resistance to go from otsu to kan.
4. That can play in the upper kan and third octave without being too shrill. 6. Slightly shallower utaguchi depth than the normal 4mm, but not too shallow. 7. With approximately 30-degree utaguchi face cut for medium resistance. 9. 330 grams in weight, up to 400. (My main 1.8 shakuhachi is about 430 grams and I have another at 450.). Could be as light as 250 grams, but not likely to find many "good" jiari in that weight — with exceptions, of course. 10. Round shaped bamboo on the top half, as flat oval on the bottom as possible. 11. With as "cold" a tone possible without being too shrill or "canned" sounding. 13. Big enough holes to assist with the deeper meri notes, but not so big as too dilute tonal subtleties. Also, the comparison of Ji-nashi to Jiari is like apples to oranges so I was not clear enough when you and I corresponded. So it seems that shakuhachi, once one gets to a certain level, are like any other instrument, it is a matter of personal taste, the music one likes to play, and one's style and playing abilities. The ( older ) Gibson, Guild, Martin acoustic guitar argument comes to mind. In my short time playing ( or trying to ), I find I am drawn to an open earthy sound, not too dense, with complex overtones that has the same kind of versatility that Moran mentions above. Moran thanks for the detail and precision -- it really helps me to quantify what I like about shakuhachi. Also, if you find that Oscar-Meyer Wiener whistle shakuhachi -- I want one! Hi Mark, As others have said, it's subjective. Some of the highest caliber instruments that have come through my shop were not pitched in A= 440hz. So if your teacher can not teach you with it, or playing Western music easily (quickly in tune) is your goal, these high caliber instruments would not work for you. I once played Christopher Blasdel's Yamaguchi Shiro instrument. I, having only played shakuhachi for 5 years up until then, found it difficult to play. 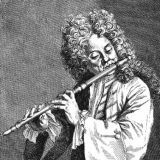 Christopher himself said it took him over 20 years to understand the flute. As for characteristics, I had a few Gyoksui flutes come through the shop recently. They were different in many ways. Each had a ballpark quality, but with individual characteristics. Some were objectively better than others when tested with specific styles of shakuhachi music. I've also had Shigemi flutes come through here. Same deal. Each unique within a framework. Imagine the makers not only as highly skilled craftsmen, musicians, scientists and acousticians, but also as artists. While traditional makers need to work within the rigid parameters expected by traditional players, they still have a certain amount of freedom of expression. have wasted alot of time that you could have used doing something worthwhile. Here's all you need to know from the book: Quality equals Tao. Caught in desire, you see only the manifestations." Conclusion: What makes one shakuhachi better than another cannot be named. Free yourself from caring and experience the mystery of the sound. John Singer had a Gyokusui Sr. 1.8 which we both agreed was the best we had seen from that maker. It was in the realm of the very fine vintage makers such as Miura Kindo etc. but not up to the best. Very good though! Riley Lee has an amazing Gyokusui Sr. 2.4 which is great, but we're not talking 2.4 here. Remember also that there are 3 different dudes with that name. I think Jeff's point is fundamental. Quality is simply something you naturally will recognize when you gather enough experience and knowledge on any given subject. We can only be our own guide on that. I didn't look for another instrument until I played my first one for a good eight years, and now I play very happily some intruments that I know would be considered "crappy" by most standards. For me they have a special quality and my playing is developed enough, after a mere thirty years of playing, to get some interesting sounds out of them. I just bought a Gyokusui and I expect it will take me a couple of years to "understand" and bond with it. It's important to understand from the beginning that the path of Shakuhachi takes immense patience and dedication... Our western ideas about "time" don't apply here. In short... my advise is to concentrate on "quality" within before you seek it without. Once you find that, the quality without becomes secondary. Here's a thought experiment. A high quality $5000 shakuhachi develops a crack. Is it now a lesser quality instrument? I've just sprung a leak in my favorite shakuhachi. It wasn't near the quality of a pristine $5000 instrument to begin with, but at least while it's in a state of disrepair it sounds like a lower quality instrument than it was before the leak. no. the value of a good quality instrument moves in one direction only even with repairs. The statement "no Gyokusui can be as good as a Shigemi" is simply false. "Good" is of course subjective, and one may favour one type of sound or flute. But not all instruments by the same maker are the same. I have played some bad Shigemi shakuhachi that make me surprised he would have even let them out of his shop. Who knows, perhaps they were cheap ones, but this illustrates that you can't judge an instrument merely on who made it. And as for Gyokusui, I can tell you a story. There were only 2 or 3 shakuhachi which the great teacher Yokoyama Katsuya ever really liked, and one of those was a 2.0 made by Gyokusui. He asked Gyokusui to sell it to him, and Gyokusui told him he makes planty of them and would make one and send it to him. He did, but it was not the same, so Yokoyama never got that one he liked. So while on the one hand this story shows how each shakuhachi is individual, on the other hand it shows that at least that one shakuhachi was a fine instrument! Justin, do you know who were the makers of the other two shakuhachi preferred by Yokoyama? The statement "no Gyokusui can be as good as a Shigemi" is simply false. "Good" is of course subjective, and one may favour one type of sound or flute. But not all instruments by the same maker are the same. I have played some bad Shigemi shakuhachi that make me surprised he would have even let them out of his shop. Have you played any Gyokusui flute which is as good as the best Shigemi or Kindo you've played? I haven't. Have you played them all? I've played about 75 Gyokusui 1.8's, about 20 Inoue and maybe 10 Kindo. Statistically speaking with sample sizes like that if they were all equal quality Gyokusui would come out ahead. Lets not argue with science! Or you could just look at it from a $$$$$$ viewpoint. Kindo and Inoue usually sells for 10K+, Inoue for 7-12K and Gyokusui 2-4K.